Etna (Sicily, Italy): Etna has been mostly calm during the past months. However, signs of unrest have appeared in the form of dilute ash emissions from the central crater (Voragine). Karymsky (Kamchatka): The volcano is currently in a comparably more active phase. Reports of ash plumes from stronger strombolian to vulcanian type explosions have become more frequent. This morning, Tokyo VAAC reported a plume reaching 12,000 ft (3.6 km) altitude drifting north from the volcano. Shiveluch (Kamchatka): Slow growth of the lava dome continues although the volcano has been comparably calm recently. Only smaller collapses and associated pyroclastic flows and ash plumes (such as one on 19 Aug) occurred. Sakurajima (Kyushu, Japan): A pancake-shaped flat dome of lava has been detected inside the Showa summit crater. This type of dome is typical for moderately viscous and gas-poor lava (typically andesitic composition) extruded at subduction-zone stratovolcanoes. The alert level of the volcano remains at 4 out of 5. One possibility is that the dome corresponds to older lava from the upper conduit that has been pushed out by a rising batch of fresher lava still inside the volcano. Manam (Papua New Guinea): A small explosion occurred this morning. Darwin VAAC reported an ash plume to 7,000 ft (2.1 km) altitude extending 8 km ESE from the volcano. Sinabung (Sumatra, Indonesia): An explosion from the summit dome occurred yesterday morning, producing a plume that rose approx. 2 km. Occasional smaller pyroclastic flows continued to occur during the past weeks as well, as the lava dome and its active lobes remain weakly active. Merapi (Central Java, Indonesia): A reported ash plume yesterday has been confirmed to be from a bush fire. The volcano remains calm. Dukono (Halmahera): Several ash plumes have been observed during the past days rising from the volcano and drifting up to 50 km NE. Colima (Western Mexico): Explosions every few hours continue to occur, sending plumes of ash to 2-3 km above the volcano's summit crater. 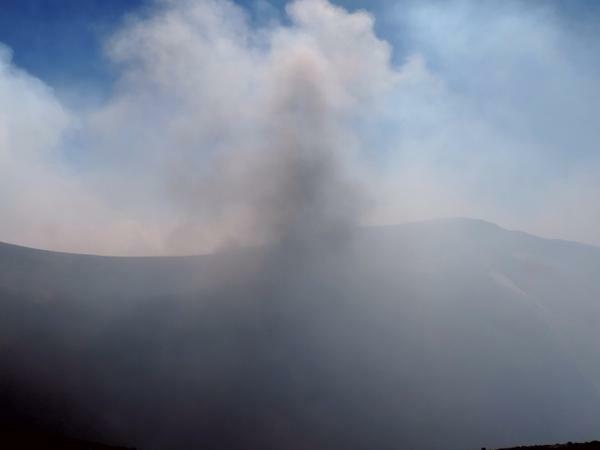 Cotopaxi (Ecuador): The volcano continues to be relatively calm. Modest ash emissions occurred yesterday morning producing plumes that rose a few 100 m above the summit and were then pushed down by strong winds along the flank of the volcano.